Do you like fishing, virtually or in real life? Fishing Resort was released for the Wii in the U.S. on November 22, 2011, with two SKUs available for purchase. There was a standalone software version with a MSRP of $19.99, or Wii owners could also buy the game bundled with a fishing rod accessory for $29.99. Fishing Resort was developed by PROPE, which is the studio formed by Yuji Naka (previous head of Sonic Team) and who is also said to be "The Creator of Sonic" in a portion of the game's description on Amazon.com. The game was published by XSEED Games for its U.S. release, and received an ESRB rating of "EVERYONE" with no content listed for parents or gamers to be aware of. The Nintendo Channel description for the game reads, "Fishing Resort is a fishing game that takes place on a large tropical paradise and uses the Wii Remote to mimic the action of casting and the Nunchuk for reeling. This paradise offers lakes, streams, and even ice fishing in addition to the deep and shallow sea fishing with more than 200 varieties of fish available." About how many U.S. Wii owners have reported fishing in the virtual paradise found in Fishing Resort since it released? Grab your fishing gear, grab your coffee, and let's take a look! Fishing, more replay value than Sonic? 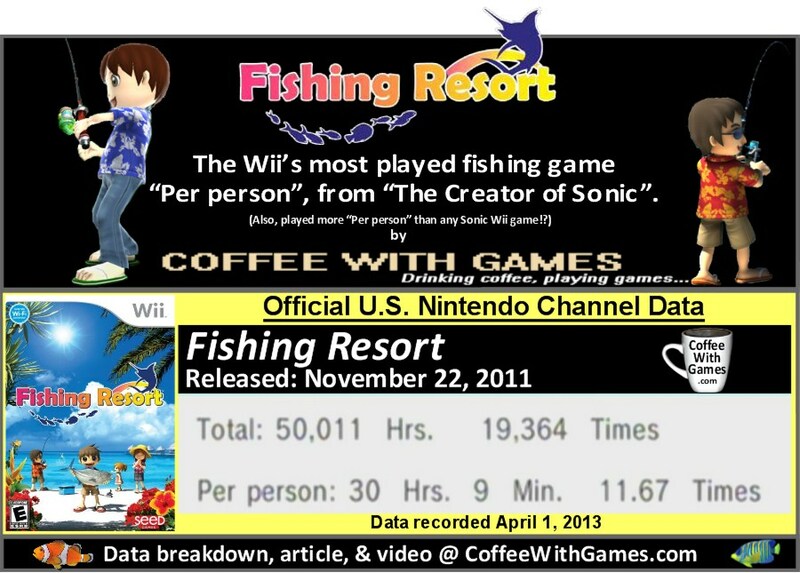 Fishing Resort has approximately 1,659 U.S. Wii owners that have gameplay data reported through the Nintendo Channel. The game just crossed the minimum 50,000 Total Hours that is required before data shows up on the Nintendo Channel, this week with 496 days possibly reported. The game's average reported play-time "Per person" is 30 Hours 9 Minutes, as the image above shows, which makes Fishing Resort the Wii's most played fishing game "Per person" in the U.S., at least according to this data. When U.S. Wii owners play Fishing Resort, they are fishing in its virtual paradise for about 2 Hours 35 Minutes each time (or day) reported. 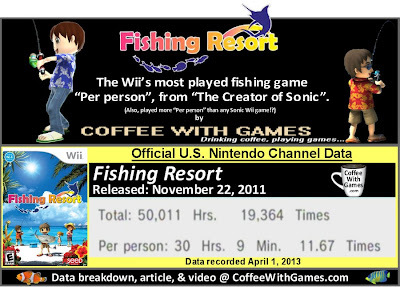 First, you're probably thinking, "Coffee, what other Wii fishing games did you compare the hours 'Per person' with?" Glad you asked! Here are the other Wii fishing games I compared the data with: Bass Pro Shops' The Strike, Big Bass Arcade, Cocoto Fishing Master, Fish'em All, Fishing Master, FISHING MASTER WORLD TOUR, Rapala Fishing Frenzy, Rapala We Fish, Reel Fishing Challenge, Reel Fishing Challenge II, and Reel Fishing Ocean Challenge. While there are perhaps other Wii games with a fishing element, these were the Wii games where fishing was the main aspect from my research. Calm enough waters to be enjoying a cup of coffee in the boat! As for the statement in parenthesis in the data image, "Also, played more 'Per person' than any Sonic Wii game!? ", here are the Sonic games I compared the hours "Per person" with: Mario & Sonic at the Olympic Winter Games, Mario & Sonic at the London 2012 Olympic Games, Sonic 3D Blast, Sonic and the Black Knight, Sonic and the Secret Rings, Sonic Colors, Sonic Riders: Zero Gravity, Sonic Spinball, Sonic the Hedgehog, Sonic the Hedgehog 2, Sonic the Hedgehog 3, Sonic the Hedgehog 4: Episode I, SONIC UNLEASHED, Sonic & Sega All-Stars Racing. If you think there is another Sonic Wii game to compare hours with that might have been missed, please leave a comment below! Now, you may be wondering how Fishing Resort was received by critics and customers? Well, the game has a "professional" review score average of 72.50%, based on 10 reviews on GameRankings.com. Like many other Wii titles I have done data reports on though, the game has a higher customer review score average of 91.34%, between both versions, based on 97 customer reviews from Amazon.com. Last year, I received an email that asked me to do a data report on Fishing Resort. The email was from gamerace, who is associated with WiiWareWave, and he mentioned how the forum activity on WiiWareWave for Fishing Resort was pretty active, with some users "playing it into the hundreds of hours". The Fishing Resort forum thread is still active, with the most recent post being just 2 days ago, on April 3rd. I responded to his email that while I was tracking the game then, it didn't have any data showing up. I said, "these type of games can take a while to show up (if at all) due to lack of advertising and name recognition". Apparently though, the lack of advertising and name recognition for Fishing Resort has not prevented the game from being enjoyed by those that have played it! So, what does having a higher reported average "Per person" than the other games I listed above likely mean? Well, if you owned all of the games listed, it's likely that you would get the most hours of gameplay out of Fishing Resort. In short, you could probably expect the best replay value from Fishing Resort, out of all the Wii games listed above. I'm glad to see another XSEED published Wii game have gameplay data show up, and hopefully they will also have success with Pandora's Tower, which is releasing later this month, in the gameplay hours and sales departments! Have any of you played Fishing Resort, and if so, what'd you think about the game? Is it a game you would recommend to Wii owners, or even Wii U owners, that are perhaps looking for a good fishing game? 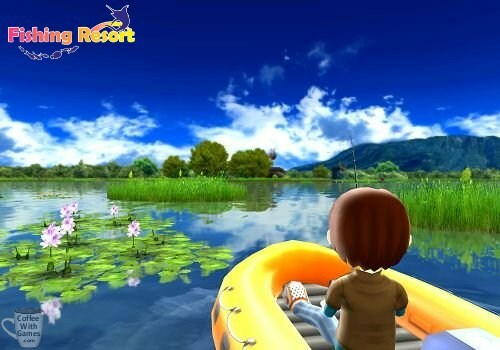 If you haven't played Fishing Resort, is there perhaps another Wii fishing game that you have played and enjoyed that you would recommend? Also, are any of you surprised that a Wii fishing game, not released even 2 years ago, has more hours averaged "Per person" than all the Sonic games on the Wii? You can purchase either version of Fishing Resort from Amazon.com, which are linked below, but watch the prices! You can also find some XSEED published games in the publisher's store, HERE. I generally don't care for hunting/fishing titles. I randomly found this on Amazon and didn't have high expectations. I was thoroughly schooled! This is exactly the type of game that can be played for 15 minutes or 3 hours can slip by. You get invested in your character's progress and disappointed when night comes and you have to stop fishing... until you get the night fishing permit! 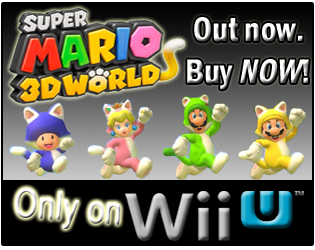 This has all the quality one expects from a Nintendo produced title with a lot less of the idiosyncratic quirks. Also, the hotel aquarium curator is Elton John for no discernable reason. Don't let the Miiverse aesthetic fool you, you can sink a lot of time in this game and it doesn't feel wasted. Truly an overlooked gem, and one I'd recommend to anybody who has a Wii or WiiU. Don't pass this by! First, thanks for stopping by! "This is exactly the type of game that can be played for 15 minutes or 3 hours can slip by." Sounds a bit like Animal Crossing, from my experience with that game anyway. Now, did you play Fishing Resort with the regular controls, or did you use the fishing rod accessory? The reviews on Amazon for the regular and fishing rod pack were both really good overall, I just wonder if the fishing rod accessory made the experience that different? Thanks for the comment and feedback, and again for stopping by! This is really neat stuff! I love how you compare hours played with the Sonic games... It's great to see that people are enjoying Fishing Resort. I'm a huge Fishing Resort fan myself. Just started playing last month, but I've been really happy with it so far, despite having no real interest in the fishing game genre. I personally got a copy with the fishing rod attachment, and think it's pretty fab – since you use the nunchuck to "reel" things in, it feels a bit silly without the attachment. I probably only put in about 5 hours... I'd really like to spend more time with it and unlock all the areas! I really had wanted this game and never got around to buying it, thus I forgot about it. Thanks for reminding me of this game, I plan on buying it eventually. It really reminds me of Go Vacation, so I look forward to seeing what it offers. Yes, I am surprised at the data, and I think it's interesting to say the least and it speaks well of the game itself. "I personally got a copy with the fishing rod attachment, and think it's pretty fab – since you use the nunchuck to "reel" things in, it feels a bit silly without the attachment." Glad to know the accessory works well, and helps make the experience a bit more like real fishing. As for comparing the hours to the Sonic games, I thought it was appropriate considering the studio/developer behind Fishing Resort, and the fact he is mentioned with a Sonic connection in the game's description on Amazon.com as well. By any chance to you have a Wii U as well? Thanks for leaving the feedback, and hopefully you enjoy the rest of your time with Fishing Resort unlocking the other areas and finding all the fish! "It really reminds me of Go Vacation..."
Yeah, I pointed the emailer to my Go Vacation piece last year that I had just posted up, and Go Vacation was referenced as "its cousin" (cousin to Fishing Resort) when I mentioned it. I think the art style of the characters in both games is very similar, but the FISH in Fishing Resort from the screens I looked at doing this post really look INCREDIBLY well designed/presented. Just as an FYI, I did look at the Go Vacation data when writing this piece, and it was just over 31 hours now. Thanks for the comment and feedback, and the RT and tweet mentions as well! Man, now you're making me want to go back and play Go Vacation some more! Ha, plus I want to buy Fishing Resort. 31 hours for Go Vacation, what do those hours represent, hours played per household? Yeah, the 31 hours for Go Vacation are the "Per person" hours, like Fishing Resort's 30 Hours 9 Minutes. Now, go find Fishing Resort, and let us know how it compares to Go Vacation! Alright cool. Yeah, you put money in my wallet and I'll go buy the game :D. Actually, I looked on the XSEED store, you can buy the game for $20, free shipping! Being a late adopter isn't a bad thing! It often times lets you get consoles at a discounted price from their original MSRPs, and there's already a great selection of games, many times discounted a great deal from their original MSRPs as well. anyway, no I didn't get the reel attachment. I generally don't like buying various hunks of plastic that will inevitably be in my way. I managed to get Link's crossbow training for $3 without the zapper, but bought NHL Slapshot with it's plastic stick, tried it out a few times and then trashed it. (The stick, not the game.) I don't think the reel would have enhanced it, but since I never tried it it's hard to say. I will say had I known how much I was going to like FR I certainly would have picked up the reel. Also, thanks to you and Jeremy for mentioning Go Vacation. I've probably walked past this game two dozen times but the cover looks like a typical mini-game shovel disc I never gave it a shot. I looked into it and have since ordered it off Amazon. 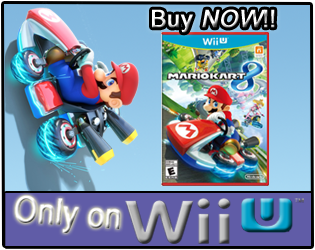 It looks fun and just goes to show there are still plenty of quality Wii titles out there. I'm jealous of any new Wii owners who can put together a solid library in an afternoon pretty cheaply. Just hoping we see titles like this on WiiU! Yeah, Go Vacation and Fishing Resort both seemed to fly under a lot of Wii owners radars. I was in GameStop during the holidays, standing in line waiting to see if they had a certain game used. There was a guy next to me looking at used Wii games, and he had 2 looking for one more. (I think they had a Buy 2, Get 1 used sale going, not sure). Anyway, I had done the Go Vacation report last year, and saw the positive comments on it and the user reviews as well, and suggested that might be something for the kids he was buying for would enjoy. He picked it up, looked at the box, and ended up buying it. One of the awesome things about the Wii U, is the backwards compatibility for Wii games, so Wii U owners can still find Wii games for cheap, and have a great collection of games to play for many, many, many years to come. Not a problem, and I was surprised to see how active the forum was for the game when I checked it out! Have you played the game? March Brewed - Coffees Consumed & Games Played!